Nice kingfish caught drift fishing on the Ft Lauderdale reef. 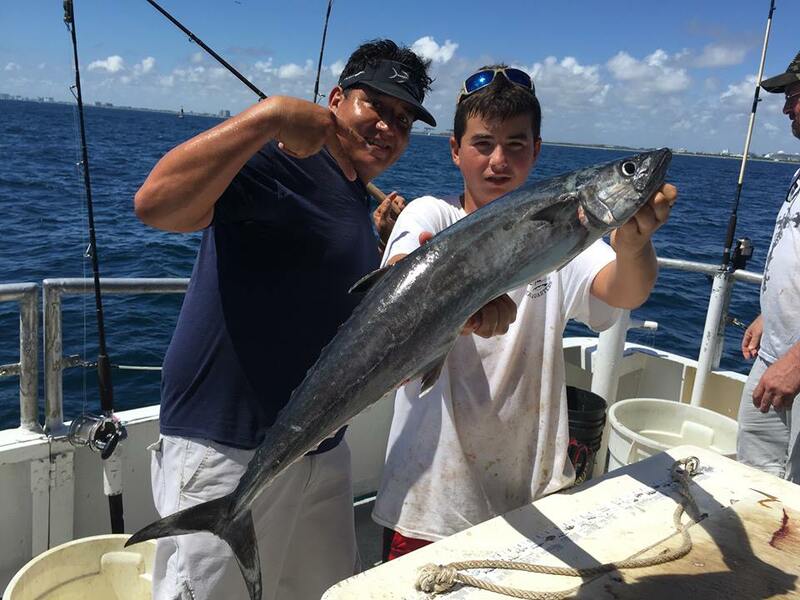 Our drift fishing trips are doing well catching kingfish, bonitos and snappers. Bonitos seem to be hanging in longer this year than in years past. They are usually long gone by now, but there are still big numbers of bonitos on the reefs. Kingfish are mixed in with them. We’re catching the kingfish by either flat line fishing a ballyhoo/sardine or by jigging a whip jig off the bow of the boat. These techniques are also the best way to catch bonito and blackfin tuna. Snappers fishing is also going good. We’re getting some really big mutton snappers here and there on the afternoon trips. Decent numbers of yellowtail snappers are biting as well as the full array of grunts, porgies, triggers, jacks and other good eating bottom fish. 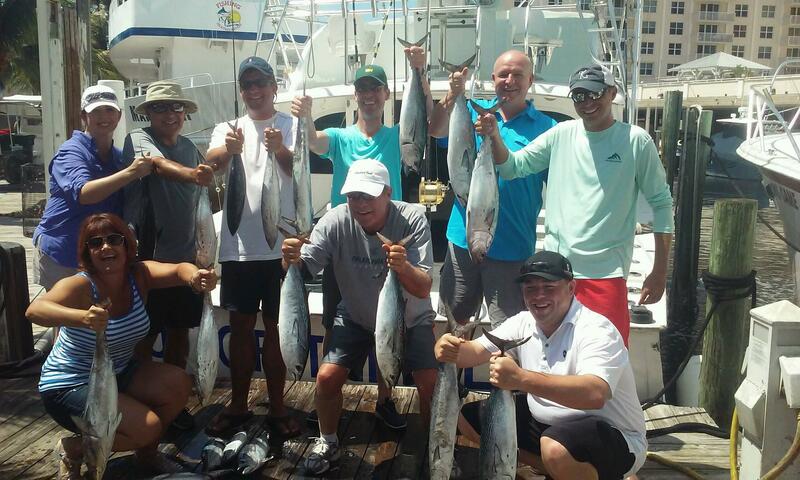 Nice catch of bonitos and kingfish on our deep sea fishing charter. Night anchor trips are catching the highest numbers of fish out of the 3 trips aboard our party fishing boat. Our night anchor trip concentrates on fishing for snappers on the bottom. Lots of yellowtails are biting at night. 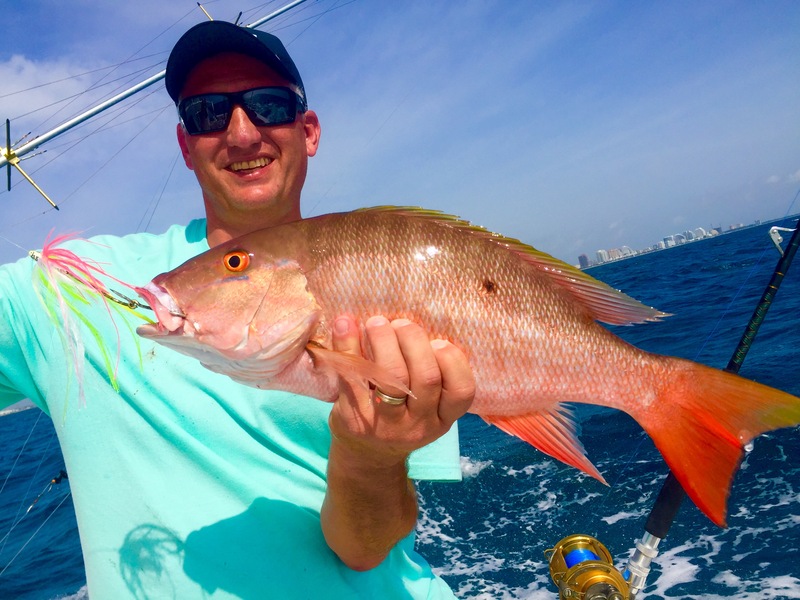 Mangrove snappers are biting pretty good too. Usually on the full moon of September, the mangroves will spawn and bite extra good. Tomorrow night is the full moon, so we’ll see. A select few muttons are also biting and they’ve been big! The muttons we’re catching this week have averaged 6-12 pounds, which is a bit larger than our average muttons usually are. Sharks are also biting on some nights on our anchor trip. We catch a lot of Atlantic sharpnose sharks, Cuban night sharks, blacktips and nurse. These sharks aren’t the monster gamesharks that we catch on our sportfishing charters, but rather 3-4 ft in length and perfect for a good fight on 30 pound test. Our night anchor trips are catching the most fish by numbers of any of our daily $40 trips. 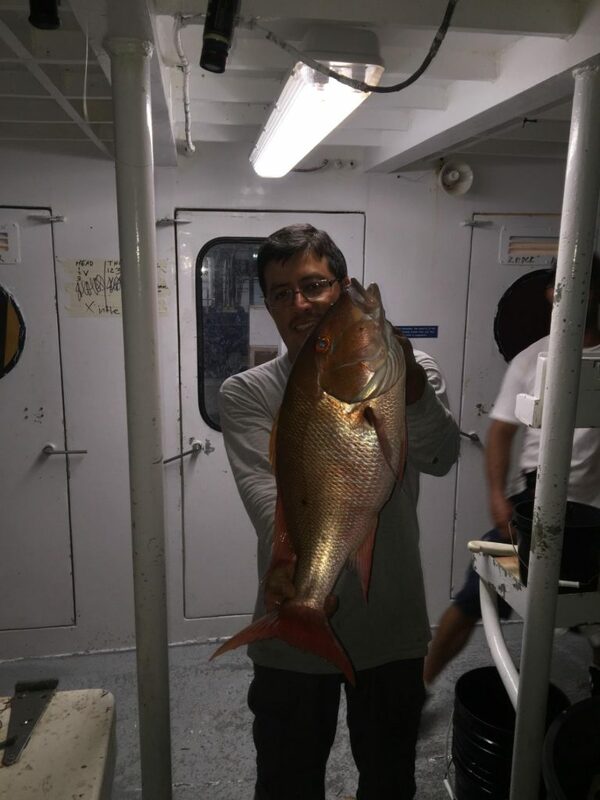 Nice mutton snapper caught night anchor fishing aboard the Catch My Drift. 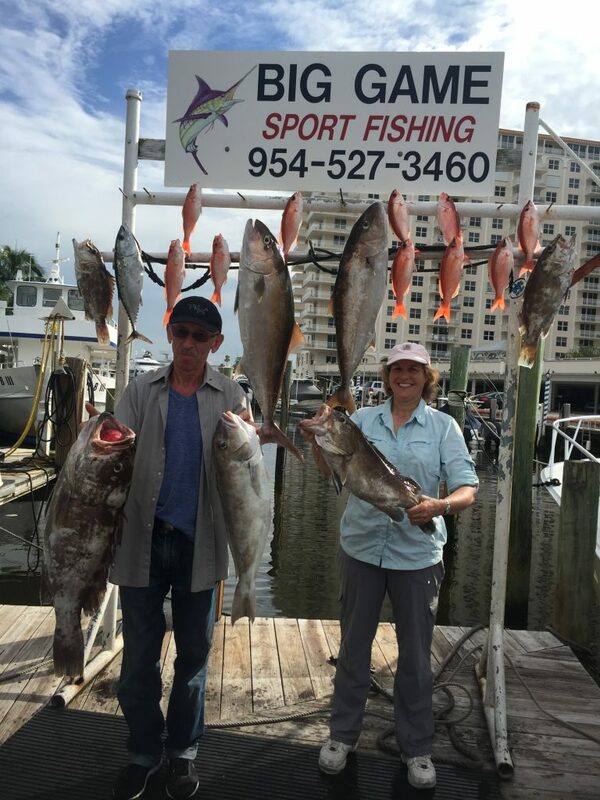 Our sportfishing charters are our best all around trip and they are coming in with the most impressive catches lately. Trolling the reefs is working excellent for kingfish, blackfin tuna, bonito, barracuda and sometimes even a wahoo. The action on the troll has made it difficult for us to switch over and do anything different. First rule of fishing is never to leave fish to find fish. But once we’ve caught our limit of kingfish, we often switch over just for the heck of it to try some live baiting. This past week, sailfishing has been off-the-scale! September is the beginning of sailfish season here in Ft Lauderdale. This is the time of year all the big game fishermen come down to try their luck at catching the most sought after gamefish in the ocean… Sailfish. This sailfish season started off this past week with a bang. We had 3 days when the sailfish were jumping in the boat. One day we caught 6, one day 8 and 4 the next. It doesn’t get much better than that. It tailed off a bit over the past couple days but that’s how sailfishing is… it runs in spurts. We get a huge influx of sailfish for a couple days and they bite like crazy, and then they disappear for a few days. We’re only a few days into sailfish season but this sailfish season looks like it is going to be epic! 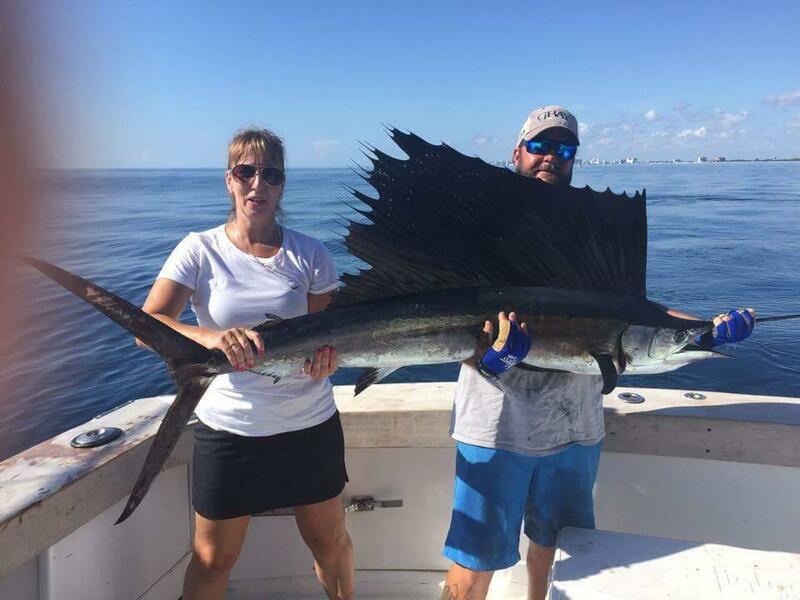 Nice sailfish caught by this fisher gal on our sportfishing charter in Ft Lauderdale. Our All Day trip is just like our regular shared sportfishing charters except that we stay out and fish for a full 8 hour day. We catch the same stuff, just more! One great thing about the all day trip is that with so much fishing time available to us, we can try a few different things on the trip to catch more of a variety. It also gives us the available time to try our luck offshore if we hear there are any mahi-mahi dolphin biting. 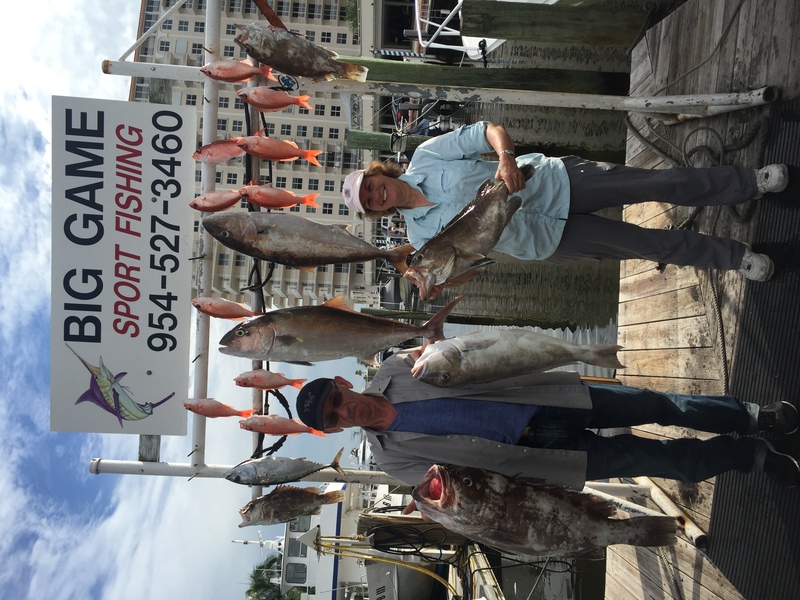 We also have been doing some deep dropping on our 8 hour trips and catching some cool deepwater fish such as grey tilefish, golden tilefish, barrelfish, scorpion groupers and more. With 8 hours, we have time to catch a bunch of fish trolling the reef, switch up and try for a sailfish by live baiting with the kites and hit the wrecks for some deep bottom fish. More fishing = better. Nice catch of groupers, jacks and snappers on an All Day fishing trip. Our inshore trips have picked up a few nice tarpon this week. We’re fishing the protected waters around the bridges and docks that line the Intracoastal Waterway. Right now, tarpon and jack crevale are biting pretty good, along with an oddball barracuda or snook. Tarpon can be caught day or night, but the bite is usually best for them on our night runs. Sharks are sometimes caught on this trip at night too. With the mullet run beginning over the next few weeks, we will have a serious influx of tarpon into our waters. 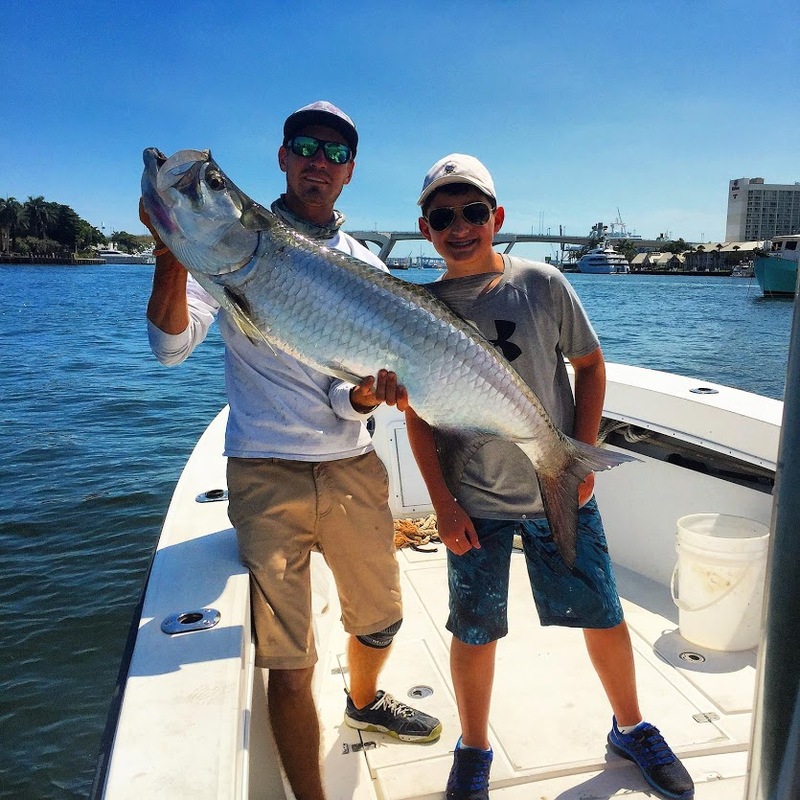 Tarpon, jack crevale, snook, barracuda, sharks and permit follow the mullet run down the coast. This is the best time of year to go out with some light tackle and fish for these shallow water gamefish. 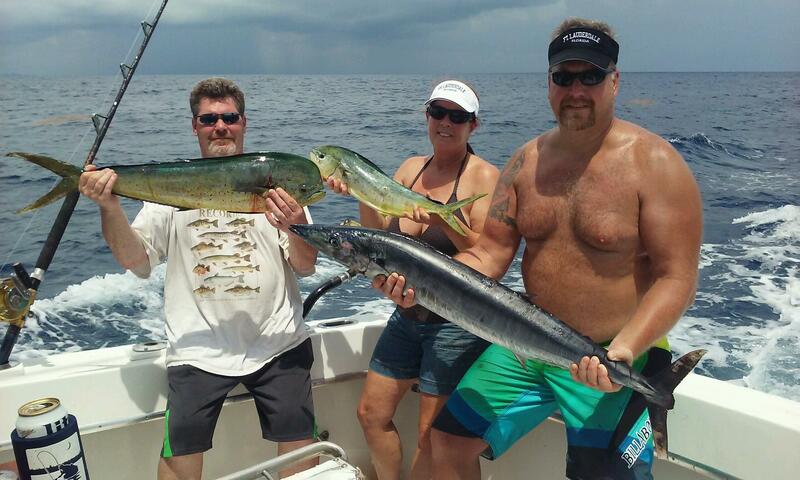 Nice catch of dolphin and wahoo on the troll, off Ft Lauderdale beach.